Recently by working on a theme i needed to built an ajax based contact form. Here is a trimmed version of that contact form script. Although, it's an trimmed version it's working perfect. You can even use it in your application by making necessary changes according to your need. 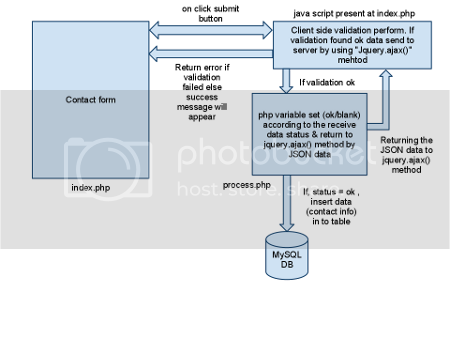 This contact form works by using following steps..
Step-2 : If client side validation is found "OK" it's send the data to the server side PHP script file(process.php) by using "jquery.ajax()" method. Step-3 : At "process.php" file all the received data are checked once again. According to the status of the received data there are some php variable get set by some status message("ok" or "blank") & return to "jquery.ajax()" method by JSON format. Step-4 : By, checking the status message "jquery.ajax()" method shows appropriate message(message sending success or failed) to user. If all the received JSON data message is found "OK" then Success message will appear else respective error will appear on the form. * Insert all the database details at "database_config.php". * Create table for storing contact information. The SQL query for creating table has given in the download files. This contact form use following open source tools..